Hello everyone, I hope you all had a wonderful July 4th weekend. It was a nice one for my family and seemed to be the first decent weekend this summer. I don’t know what the weather has been like in your corner of the world, but around the Chicago area it has been a very mild summer indeed. We could definitely use some sun around here! But in a way, I already got my sun fix this summer because a few weeks ago, my family and I took a trip to Orlando where we thoroughly enjoyed a week at Disney World. We are a big Disney family and try and get out to either Disney World or Disneyland -or both 😉 once a year. And one thing I love to do when at Disney is to eat! Disney has some great eats and treats. They especially have some great cupcakes! 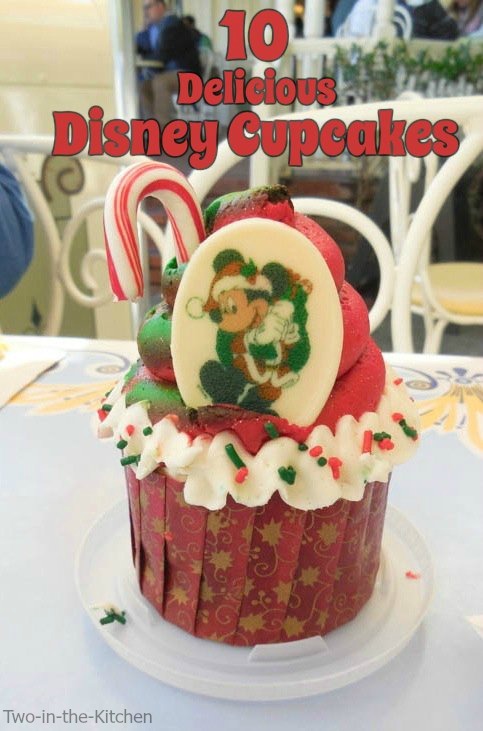 If you have been to Disney but haven’t tried any of their cupcakes, you are sorely missing out! 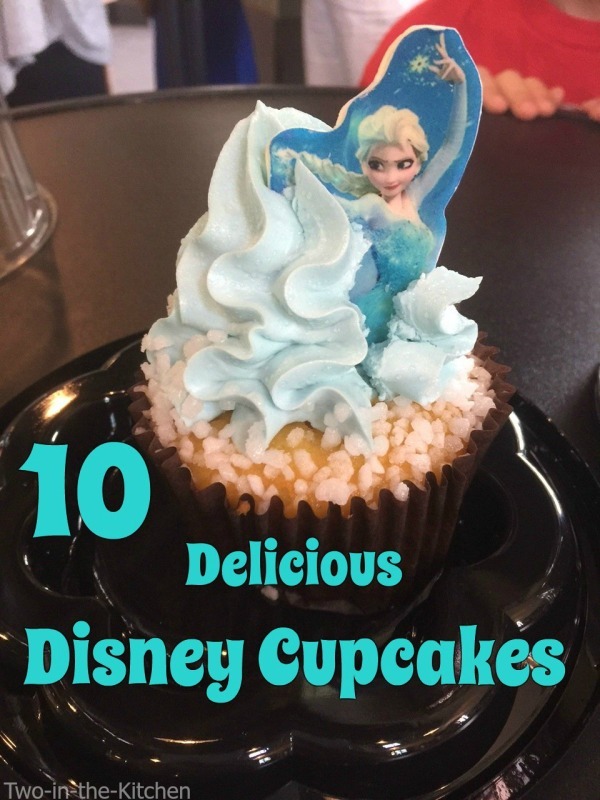 Here are 10 amazing Disney cupcakes in no particular order that you simply HAVE to try! 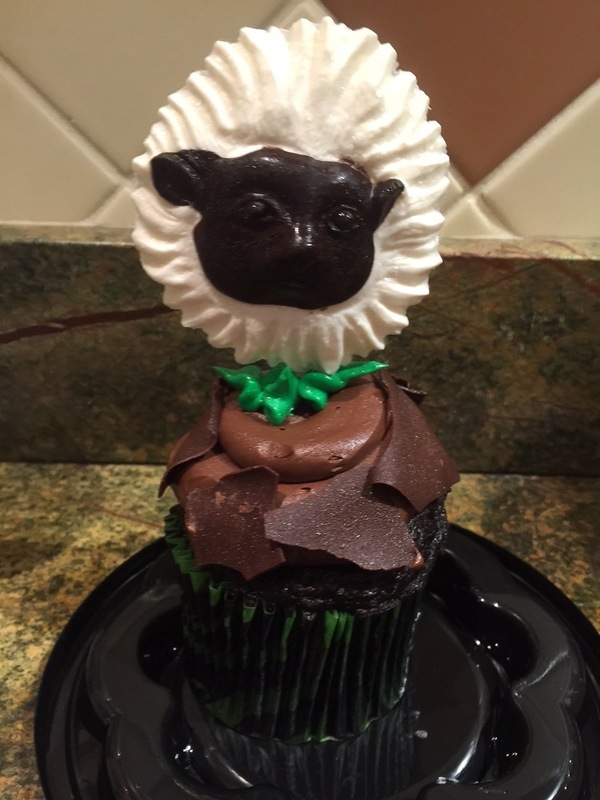 Animal Kingdom at Disney World is known for some interesting cupcakes. You can get the first two cupcakes on the list at Kusafiri Bakery in the Africa section. Or you can get them at Creature Comforts which is the park’s Starbucks coffee shop. This first cupcake (above) is a giant chocolate cupcake that has a thick layer of chocolate frosting (behind the logo) and a thinner layer of vanilla frosting. The pretty green sprinkles gave a nice texture to the frosting. 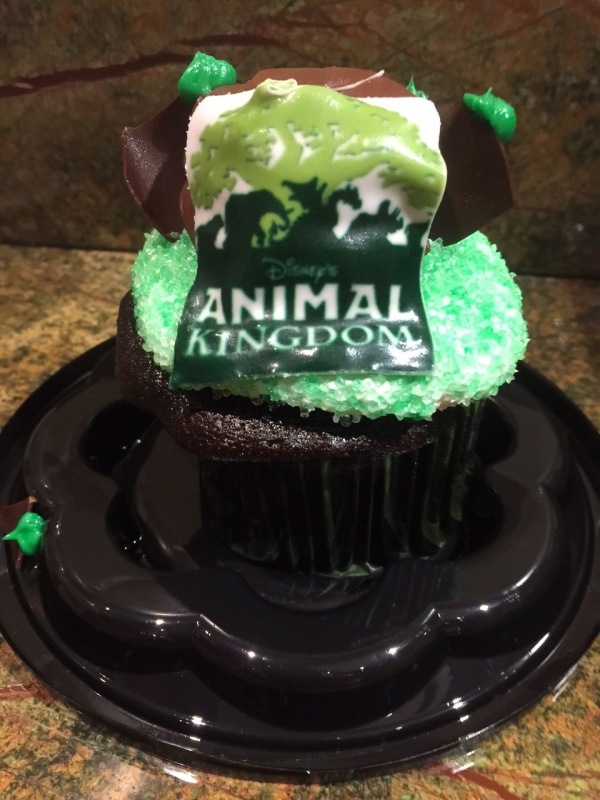 The second cupcake here (below) is also from Animal Kingdom and features a Cotton top Tamarin white chocolate lollipop on top of the double chocolate cupcake. My 7 year old son really liked this cupcake because he liked having the huge lollipop all to himself. But I tried this one and really wasn’t too impressed. It was a bit too much chocolate and nothing too special in my opinion. The next couple cupcakes featured are from the Boardwalk Bakery near Epcot at Disney World. I highly recommend going to this bakery as the Boardwalk itself is fun and it has several specialty cupcakes that you can’t get elsewhere. There are two easy ways to get to this bakery. First of all, if you are already at Epcot, you can exit the park through the International Gateway and take the short walk to the boardwalk. 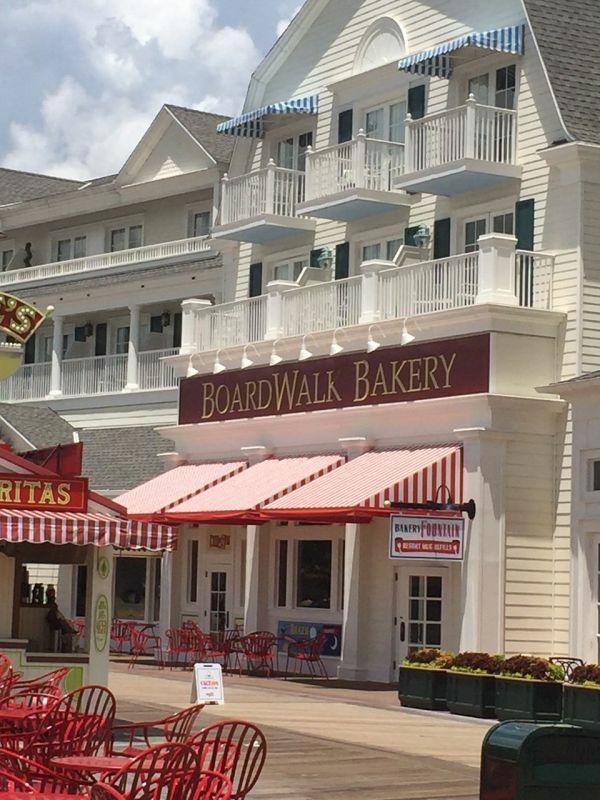 Or you can drive to the Boardwalk Inn and let the parking attendant know that you plan to eat at the Boardwalk Bakery and he will gladly let you park in the hotel parking lot in order to access the boardwalk. 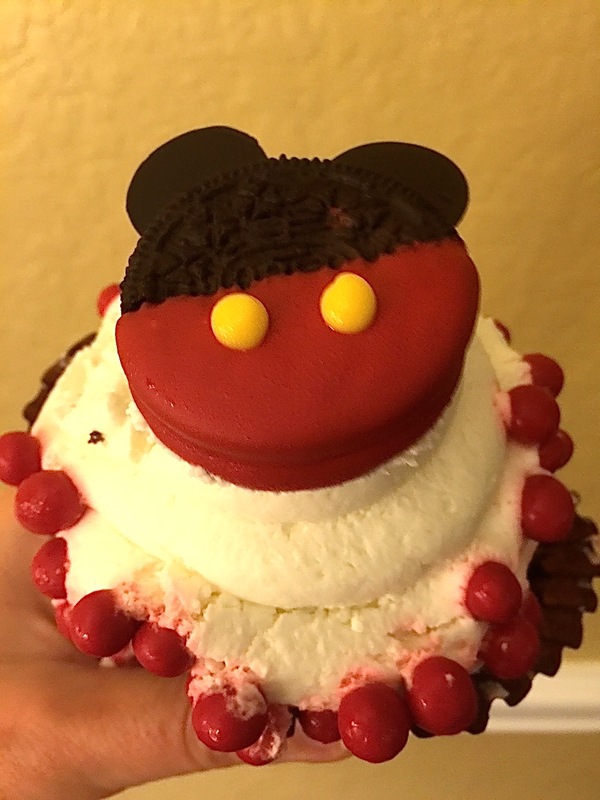 This first cupcake from the Boardwalk Bakery is the Mickey Oreo Cupcake. This cupcake is large and delicious! It’s also quite cute with the Mickey Mouse oreo on top. The frosting is fluffy and inside is a special cookies and cream filling. The red candies on the outside are whopper-ish and give a nice contrasting texture. My whole family agreed that this cupcake was a winner! 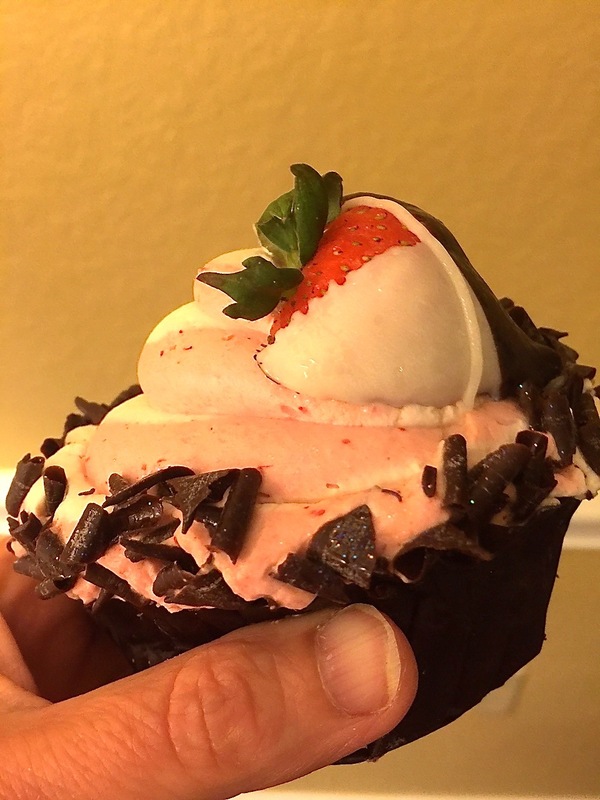 The second cupcake we tried from the Boardwalk Bakery is quite different but equally as good. In fact, I liked this one even better. This strawberry cupcake has a light and airy strawberry frosting on top and is filled with the most remarkable chocolate chip and strawberry filling. The chocolate strawberry on top was a nice touch as well. This cupcake was simply delicious! These next two cupcakes on the list are just to show what a great job the Disney restaurant buffets do with their dessert spreads. This particular picture below shows some of the mini desserts at Cape May Seafood Buffet at Beach Club in Disney World. I’ve also been to several other Disney buffets and they all have similar treats on their dessert tables. The two cupcakes shown are a red velvet and peanut butter chocolate. Though these mini versions can’t compete with the gigantic cupcakes featured at the bakeries, they are still quite nice. And after all the food you will consume during the meals themselves, the mini size of the cupcakes is about all you will be able to handle anyway, trust me! 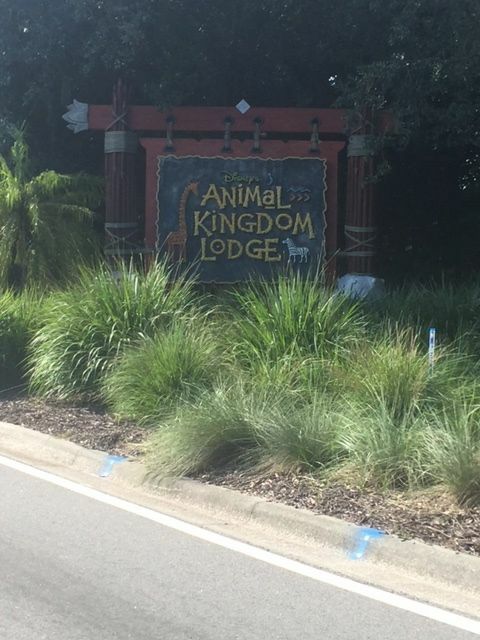 Our favorite buffet in the “world” (Disney World that is), is at the Animal Kingdom Lodge and is called “Boma”. If you are a foodie and like your food to have good flavor and even some heat, then “Boma” is for you. Since this post is about cupcakes, I won’t go into detail here about the delicious food itself, but Boma is a favorite of my entire family as there is something to be savored and enjoyed by everyone. 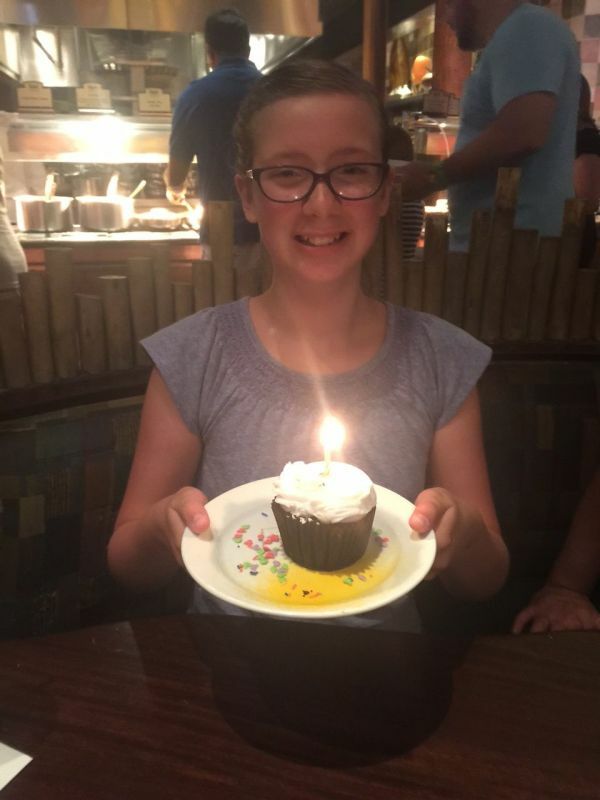 It was my daughter’s birthday while we took our Disney trip this year and she picked Boma for her birthday dinner. The server was kind enough to bring out a special birthday cupcake for her. Since my daughter has a nut allergy and is picky about what she eats, she actually passed the cupcake off to me. It was quite yummy with a chocolate cake base and thick vanilla buttercream frosting. Our next stop on the cupcake tour is at Hollywood Studios in Disney World at a bakery called “Starring Rolls“. 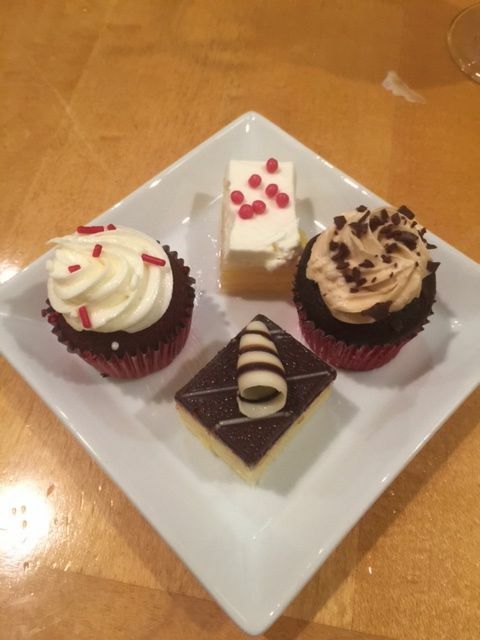 You can also get the cupcakes pictured below at Trolly Car Cafe which is the Starbucks inside Hollywood Studios. The Elsa Cupcake shown below is not only beautiful, but delicious as well. It is also the only vanilla cupcake I have featured on this list. Even though I am more a chocolate fan, this vanilla cupcake was quite tasty. It was buttery, dense and moist. The pretty blue frosting was light and creamy and the large sugar crystals gave a nice texture contrast. 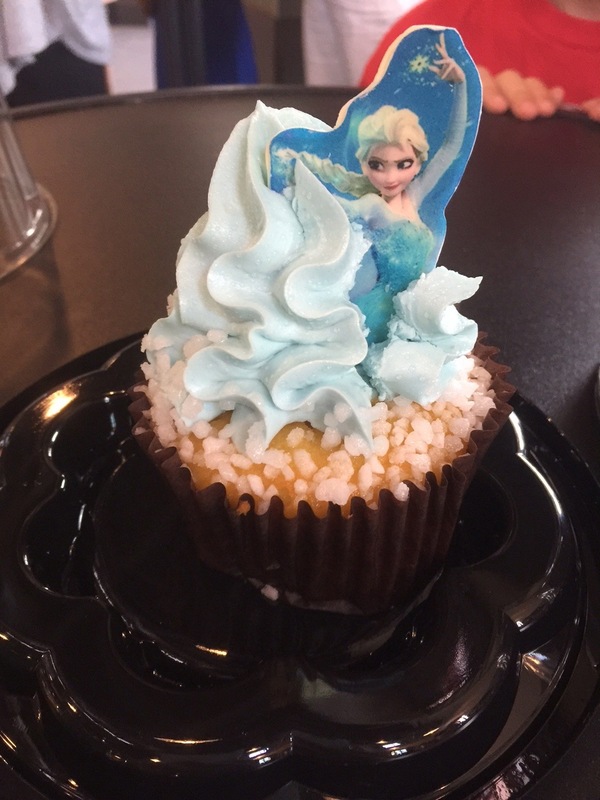 The Elsa cupcake is a specialty cupcake during the “Frozen Summer Fun” theme at Hollywood Studios this summer. The capstone of the Frozen summer festivities is a stunning fireworks display at night with the climax being “snow” falling on the main drag. 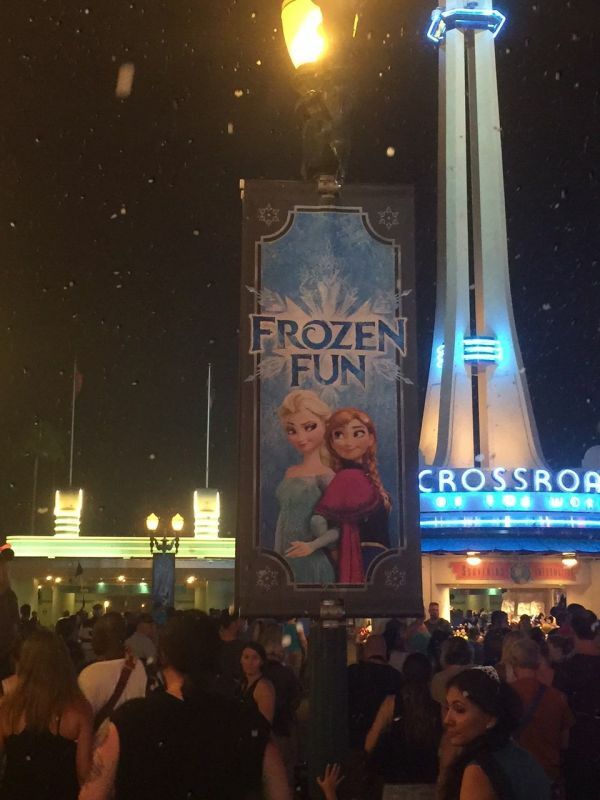 It was seriously quite cool to see “snow” falling in Florida at the end of June! 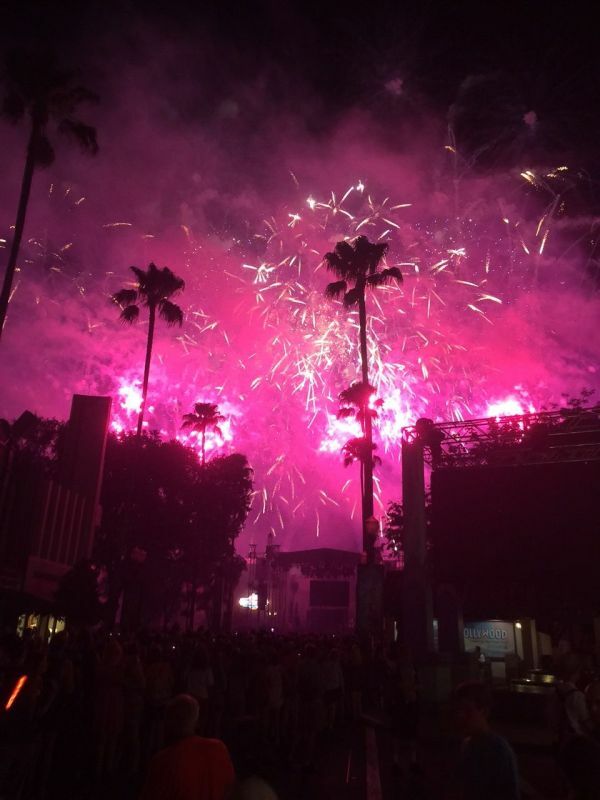 And the fireworks themselves were simply stunning! It was a highlight of the trip for us! This second to last cupcake on my list was not only the best cupcake I had on this trip, it is also quite possibly the best cupcake I have ever tasted in my life!! 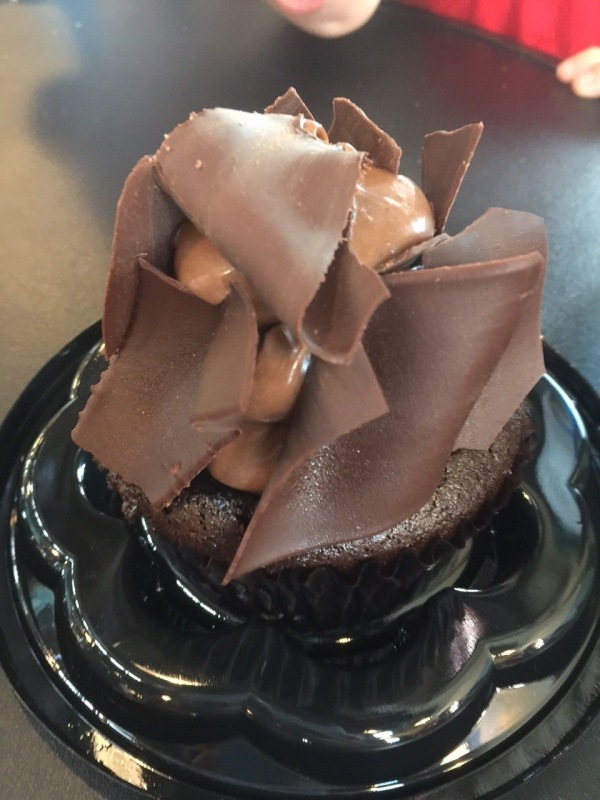 This is the famous Chocolate Peanut Butter Cupcake from Starring Rolls bakery or Trolley Car Cafe at Hollywood Studios. 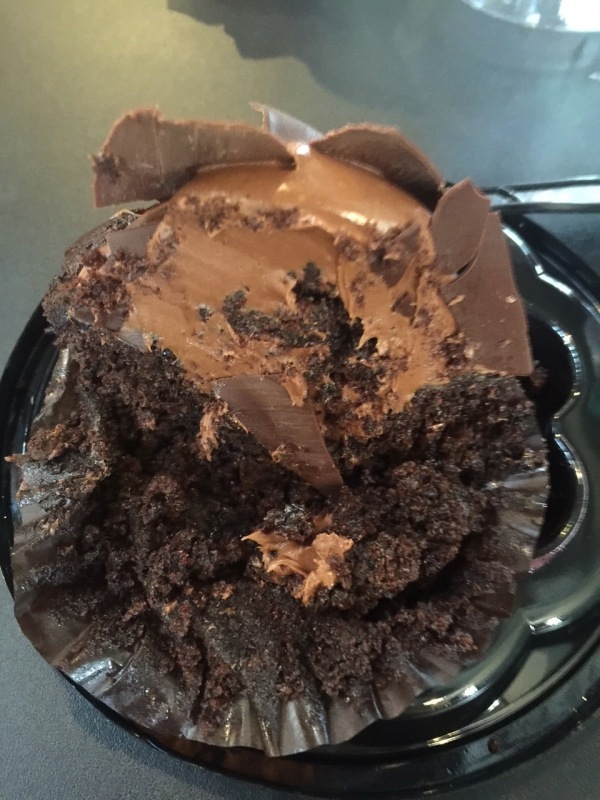 This ginormous cupcake is a dense chocolate cake topped with the most amazing peanut butter frosting that you have ever tried. And it is covered in giant chocolate shavings. It is seriously so amazing that it is worth the cost of admission to the park on it’s own. (No joke!) 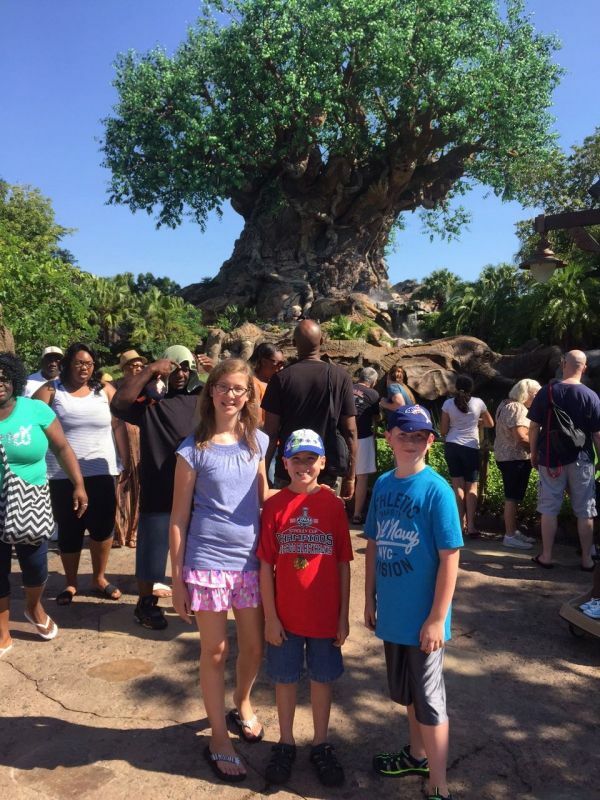 It is literally the first thing that my 9 year old son talks to people about when telling them about our Disney vacation. Oh, and when I say peanut butter frosting, I mean that this thing is covered in it. Look at how deep this frosting goes down into the cupcake! My son and I each grabbed a fork and started shoving as much of this little piece of heaven into our mouths as fast as we could. It was literally gone in seconds!! It would be extremely difficult to top that amazing Chocolate Peanut Butter Cupcake in my book. And I’m not going to say that I’ve had one that is better, but taking into account the magical time of year that this last cupcake on the list is offered, it definitely comes close. 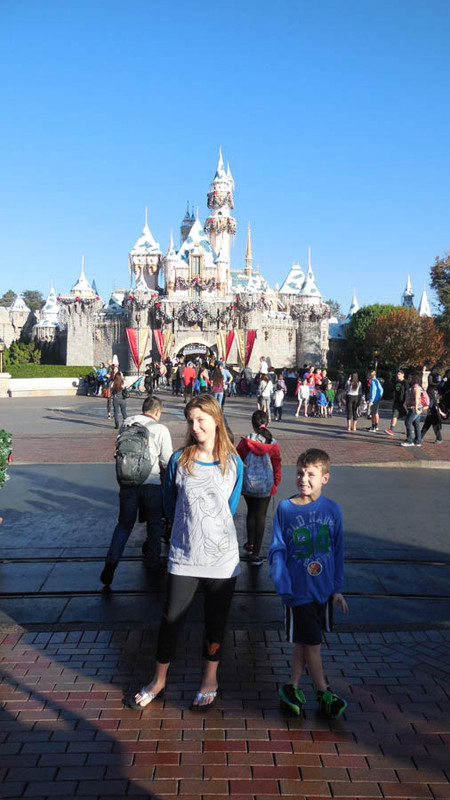 This past Christmas, my family and I went to Disneyland in California. It was so beautiful and magical that going to Disney during the Christmas season definitely takes the experience to a different level. 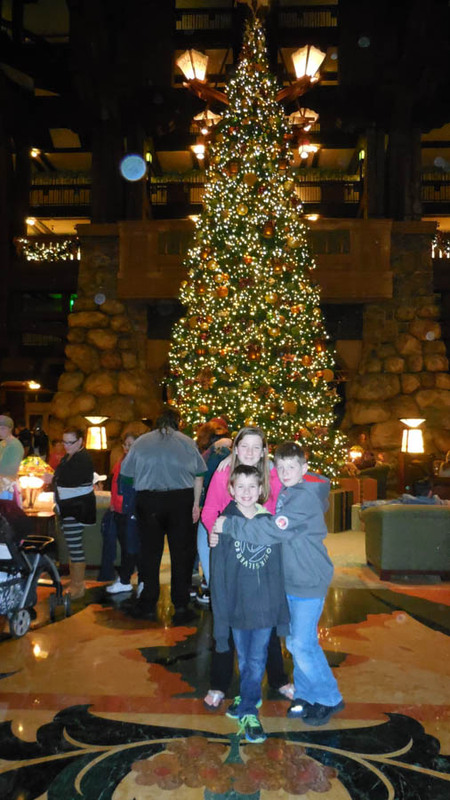 We stayed at the Grand Californian which was a visual delight in and of itself. But even with the decorated castle and the stunning Christmas tree in the Grand Californian, I think one of the best sights I saw the whole trip was this gorgeous Christmas Mickey Cupcake! I hope you enjoyed this decadent trip to some of Disney’s best cupcakes. Were you inspired? Which cupcake would you want to try first? Going to Disney? These items may be useful! These are all so cute. I bet my niece would love all of these! Oh my goodness, so many awesome cupcakes never enough time to try ’em all! I seriously love all of these, Renee! What a fun post! These are all so fun! Looks like you guys had a fantastic time. And now I want something sweet…. Such gorgeous cupcakes! Disney has the BEST ones! I LOVE Disneyland, but sadly nobody else in my family is as crazy about it as me. Maybe I need to come with you guys! And these cupcakes look so beautiful and equally delicious!